Home › Trades › Consulting › Hey India! Yesterday I received an invitation to attend the International Automation Exhibition 2014 to be held in Mumbai, India next October. Now as many who have read this blog know, I love to travel, especially to other countries. This May I will be going to Japan, Shanghai and Hong Kong, mostly for fun, but I may be working some business in while in the region. The map at the top of this page is from Google Analytics. It shows who reads this blog in a graphical format; the darker the shade, the more people who visit my site. Of course most readers are from here in the US, but you would think that the next most hits would be from Canada, the UK or Australia. After all, there are a lot of English speakers and manufacturing facilities in those countries. 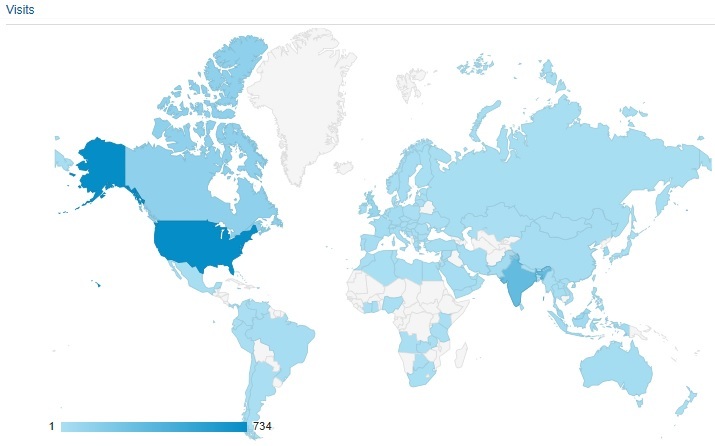 As you can see, people from India clearly follow this blog more than any other country outside of the US. This has been consistently true since I started using Google Analytics about a year ago. Malaysia is also a surprise; I probably get more e-mails from Malaysians than any other country, especially about my book, Industrial Automation: Hands On. I also receive reports from McGraw-Hill on my book sales, and about 60% are sold outside of the US, though I don’t know from which countries. Because of this, I am seriously considering a trip to India next October. Of course, this kind of trip would not be inexpensive, so I am thinking of ways I can help defray the costs. Since I do consulting and training, any contracts in the area where I can speak, teach or consult would be great. In addition, I have a commercial software project I have been working on that may warrant a trip to Bangalore, the Silicon Valley of India. The SmartBench idea is also something that may work well in manual assembly applications in India, so finding a partner in the area would be useful. It is still very early in the year, so I haven’t filled my schedule for the rest of 2014 yet. I was in Chicago last week teaching a ControlLogix class, I will be in Evansville for the next two weeks working on a big production line, followed by another week teaching Siemens programming in Oklahoma. My schedule tends to fill up pretty quick as the year goes on, so there is a point at which I really need to commit if I want to do any additional international travel. So for those of you who read this blog and live in countries outside of the US, let me know if you have any interest in training or consulting services. From my perspective, the opportunity to visit other countries may take priority over domestic contracts. This trade show in October may be an opportunity for me to promote my book and visit India, but I am interested in any other international opportunities that may arise also!